Included here is a short excerpt from a service tech's training tape. 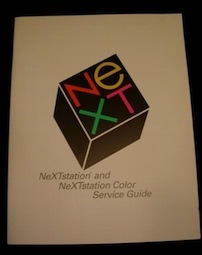 The collection has the Service Manual and training tape for both NeXTStations and NeXT Cubes. As you watch the video observe how simple it is to service when compared to any PC, then or today.... for example, one screw to remove any device or no rats nets of cables outside or inside the box. Also compare this video except with that of the NeXT Laser Printer Servicing Video. Canon made the printer and it's complexity reflected the state of the art of that time. The NeXT Computers were as elegant on the inside as they were on the outside. We are only now beginning to see similar elegance in hardware design, notably first from Apple.